So let's say you hit metal or otherwise caused a dent in the tool or found a tool in damaged state. For argument's sake say maybe at least a 2-4 mm dent or chip. The following is an extreme example of both. From what I remember the sharpening techniques discussed here already at WW.SE govern sharpening dull tools. What does one do in the case of this type of irregular, severe damage? Another example of just a chip which could likely happen. Do you just do more of the roughing step (like standard sharpening) or is there something else that should be done first? I understand that some options are listed in the pages I linked but I wanted the community here to have a go. Obviously both of those cases are quite severe examples of edge damage, but even for single chips smaller than this re-grinding the bevel manually can be challenging. This level of edge repair is generally considered a job for power grinding. It is possible manually, I've done it entirely by hand on 'rescue chisels' using a combination of diamond plates and a coarse waterstone, but it's not something you'd want to do routinely. It's a lot of work and if you're sharpening freehand because you have to stop and check for square frequently (and then adjust as needed if you're going out of square) it takes even longer than you expect. If you do this with any frequency you'll probably want to use some kind of powered grinding/honing tool for the bulk material removal, a small bench grinder as least. It doesn't have to be an expensive grinder and it doesn't have to be a low-speed model or have a cool-cutting aftermarket wheel, although both of those are advantages. But at higher speeds using a typical aggressive wheel (often grey in colour) you will want to have a container of cold water immediately to hand to dunk the chisel tip into periodically to cool it before continuing. Note: some sharpening gurus (e.g. Leonard Lee in his book on sharpening) say this dunking leads to microfractures that damage the steel near the tip and make it prone to chipping, however, cooling in cold water periodically during grinding is extremely common practice and most users experience no issues. Myself, I've seen no evidence of it when cooling metal cutting tools (knives, gravers and chisels in various metals) during various grinding operations. However, it is probable that the key thing here is the size of the temperature change. So dunk early and often, and after the first dunk pay attention to the drops of water on the back of the chisel — they give you a read on how the temperature is rising. As with all grinding, don't press hard. Let the stone do the work, it should almost be the weight of the chisel against the stone pressing it home. Even doing this the tip will heat up and pauses or dunking in water may be necessary. Your first thought might be to just work on the bevel, grinding back at that angle until the chips are gone. This is a mistake because there's a high potential for the thin edge to overheat (thin metal heats up fast). It's a bit scary but it's actually better to grind the edge 90° and straight across until you've removed the chips, then work to re-establish your desired primary bevel angle. 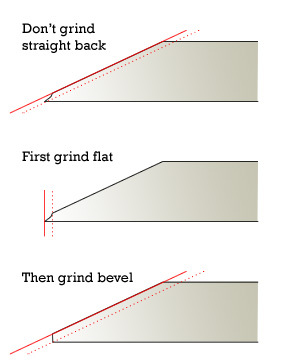 This way you're grinding at or near a thin edge for minimal time. Although the chisel can be held in the fingers for both grinding operations once you get to grinding the bevel itself a jig can be a big help. Even without dunking you need to pause periodically to inspect the progress of the grind on the bevel and it can be difficult to maintain the same angle accurately, so some sort of jig is highly advisable. 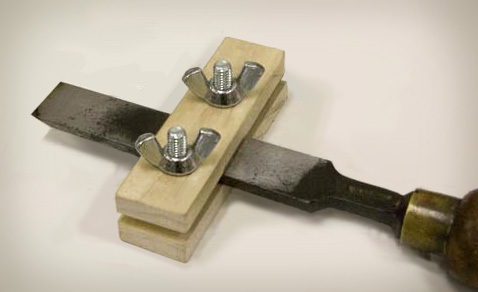 As you can see you can knock up something that will work well from shop scrap and a few bits of inexpensive hardware. If a powered grinding tool of any kind is not in the budget, or you simply enjoy the hard work and challenge, I'll include a basic guide to doing this manually. First off I would highly recommend using a coarse or extra-coarse diamond plate for the bulk removal. The difference in grinding speed of diamond is quite noticeable when doing this level of material removal. A coarse waterstone can be used, but it will take much longer. A coarse oilstone can be used, but it will take longer still. If doing this on a waterstone, even being conscientious about working over the entire stone, expect that you might need to re-flatten the surface after doing this amount of material removal. Most particularly with any very hard chisels with waterstones wearing quickly it's possible you may need to re-flatten once during the operation. Not due to the risk of overheating, again it seems like it's best to grind the tip flat across until the chips are gone and then to set to work grinding the bevel much as you would doing regular sharpening. It's hard to explain why this works better but I've tried both ways and I highly recommend it as the way to tackle this sort of major re-profiling. If using stones grind the edge flat on the side of the stone if possible; it's very easy to dish the face of the stone otherwise. If it's that damaged, you're looking at removing a lot more metal than normal, creating an entirely new edge. Typically, that means careful work with a grinder (being careful not to overheat the metal), a metal-cutting file, or something similar. Once the tool is returned to the correct shape, you can sharpen it fairly normally -- flatten the back, establish the primary bevel, sharpen, sharpen microbevel, deburr and hone. 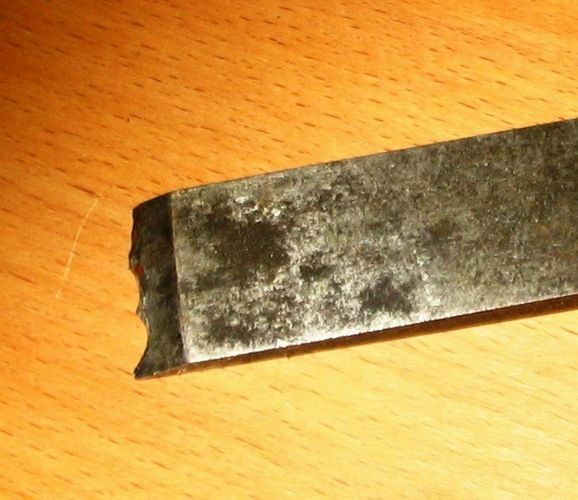 I'd start with a file, removing metal perpendicular to the blade until the damaged parts are removed. Take it slow, check often to make sure it remains square and make sure it doesn't get too hot. A rule I've heard is if it's too hot to touch, it's overheated. But using a file I'd be surprised if it would get cooked, especially if you're checking often for squareness. After that, I'd rough cut the bevel with the file. Get it as close as you can then move onto your preferred method of final sharpening. Personally I use a Work Sharp 3000 and love it, but there are lots of other ways to do so and lots of helpful info out there. A belt sander mounted upside down (preferably in a jig) works adequately to quickly and easily remove material. Just remember to regularly cool the steel by dipping in water and don’t forget to remove the dust bag or you will have a fire risk! For fine work you will want to finish the chisel on a oil or diamond stone but for general carpentry just remove the burr and you’re ready to go. I have sharpened chisels this way literally thousands of times and will often use this method over my Tormek water-cooled grinder. Not the answer you're looking for? Browse other questions tagged sharpening plane tool-maintenance chisel tool-repair or ask your own question. How do I completely disassemble a hand plane to clean it and then reassemble it? How and when should I sharpen my router bits? Does it matter what type of mallet I use with my chisels? How long does it take to sharpen a saw blade? How to prevent plane from clogging?